Funny timing. Just last week I posted an article about how the 13.3-inch Sony DPT-S1 is still a popular choice even with newer less expensive options available. Now this week the Sony DPT-S1 has turned up on sale at Amazon and B&H.com for $699. That’s $100 less that it was selling for last week, and about half the price that it was selling for a couple of years ago before it was widely available in the US. When Sony first started selling the DPT-S1 in the US, only a few organizations sold it and they were only allowed to sell it to certain kinds of business professionals, so the price was driven up on websites like Amazon and eBay. When it first arrived in the US it officially sold for $1100. Eventually Sony dropped the price down to $999, then about six months later the priced dropped even further down to $799, where it has remained steady for the past year. This is the first time that they’ve lowered the price to $699. 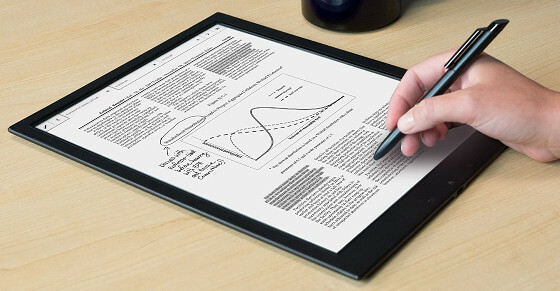 It’s unclear how long the sale will last on Sony’s specialized E Ink PDF reader, or if it’s a new lower price. Either way it looks like having more competition has the added benefit of bringing the price down. Too bad Sony hasn’t shown much interest in continuing to develop the product. It was first released in Japan in late 2013, and so far there have been no signs of a potential 2nd generation model. I seem to recall you mentioned awhile back that this device only supports PDF files and not ebooks. Has there been any kind of update or is this still true? Can’t see spending $699 for a device that only reads PDF’s. What about sales’ figures? Was it sold well? May be it was adressed to a very limited group of people (architects, engineers) who liked tablets instead? Their strategy is complete wrong. The price should be $699 for upgraded 2016 hardware now. Also, people really expect some official support and updates for a $1100 product. It’s no wonder it’s not selling well. Sony has no idea what their doing with the after-sales. The product is basically good and I’d buy it, but it’s a suicide mission and probably I’d throw it in garbage bin or donate to a hacklab in 6..12 months. Is 6 months a proper lifetime for a $1100 product? Its a niche product. For architects, contractors, engineers… — who basically need to refer to large PDFs and be able to read the documents in daylight. They are probably doing well with the intended target market, although like most everyone on this thread — I wish the price could come down so it would be palatable for the consumer market — not just Professionals. Wish that Sony still made a smaller ebook. I loved my old reader, but it died. I have a nook now, but the old one was much better (even without a backlight). Just take this screen and cut it in half, and allow reading of epub as well as pdf. Does anyone know how I can get hold of this from Europe?